At $15,000, Could You Fall Under the Spell of This 1978 Dodge Warlock? 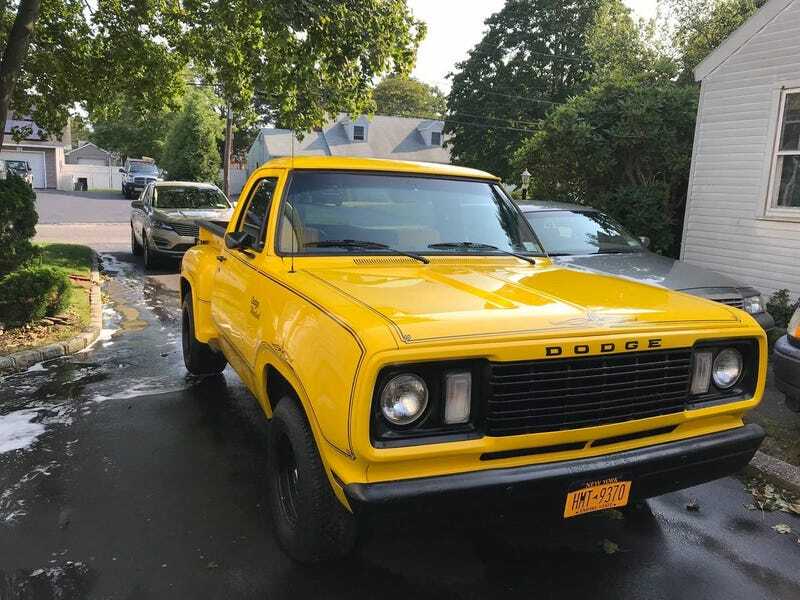 While the nineteen seventies was an era of decline for muscle cars, it also gave rise to a short-lived age of fun trucks, led by Dodge and models like today’s Nice Price or Crack Pipe Warlock. Let’s see if there’s any magic left in this machine. It’s said that beauty is in the eye of the beholder, and those who beheld yesterday’s 1997 Ford Mustang Cobra didn’t find much that appealed. Featuring a wild body kit by Duraflex and paint as orange as a Kubrickian Sun, that low mileage Mustang couldn’t manage a second look, not even at a seemingly reasonable $7,950 price. The mods overwhelmed the price and the ‘Stang fell in a massive 88 percent Crack Pipe loss. There are certain folks who, owing to a deeply held personal faith, deny themselves the pleasure of reading the Harry Potter stories. Their reasoning is that magic is real and evil, and by reading books in which the central theme is wizards and witches they might be somehow be seen as advocating the dark arts. Hell, they might even be seduced by the thought. I wonder how those folks might feel about driving around in a truck that goes by the name Warlock? Back in the 1970s, Dodge put performance in pickups with a ragtag lineup they dubbed their ‘Adult Toys.’ Now today that phrase has a different and wholly salacious meaning—hell, back then it probably did too—but it still allowed Dodge to push out a few pretty cool trucks. One of those is represented here by this 1978 Dodge D150 Warlock. Originally intened as a factory custom, the Warlock was a trim package on the standard D-series (2WD) and W-series (4WD) short-bed trucks. The alterations to make a Warlock included paint options that were limited to black, red and metallic green. To each of those was added filigreed gold pinstriping and solid oak sideboards bracketing the double wall bed. Chrome sidesteps and gold trim on the interior rounded out the model-specific updates. This Warlock has seen some changes over the years to make it a bit less... well, Warlock-ian. The original black paint with gold striping has been replaced with yellow and black and both the chrome sidesteps and the oak planking in back have gone missing. The interior too looks to to be less Warlock and more let’s make it look nice and tradition be damned. Still, it all seems to be in pretty good shape, and it does still say Warlock on the tailgate which sounds pretty badass. The mechanicals are a 318 V8 that is claimed a few years fresh and an A-727 three-speed automatic behind that. Power is sent to the rear wheels only as this is a 4X2. The ad notes the addition of an Edelbrock intake and 4BBL carb and notes that the engine is further dressed up with polished valve covers and a triangular air cleaner. A 2-cylinder A/C compressor sits high in the valley ahead of the cab but that is sadly said to be non functional. Other features include power brakes (discs in front), and power steering, both apparently functional. The truck looks to be pretty solid both top and bottom and comes with both a clear title and just 60K on the clock. The question arises though, has it strayed too far over the years and those miles from its original factory custom roots? How much magic is still left up this Warlock’s now yellow sleeve? That’s an important question while you’re considering the truck’s $15,000 asking price. Real-deal Warlocks can ask twice as much, but then plain jane D150s can go for half. Is this Warlock (or what’s left of it) enough to meet that middle ground? Long Island, NY Craigslist, or go here if the ad disappears. H/T to Twowheelsev for the hookup! At $7,950, Could This 1997 Ford Mustang Cobra Get You To Bite?